Known for its temple density, Tamil Nadu is one sacred and spiritual state in India. 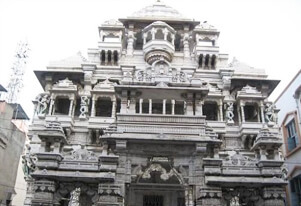 The state also boasts of some exquisite Jain Temples that make excellent pilgrimage site. In our 4N/5D Tamil Nadu Jain Temple tour, we offer to take you on a holy journey of two important sites in the state, namely, Chennai and Kanchipuram. 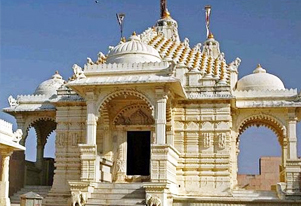 Embark on a religious journey to these two destinations that house magnificent Jain Temple. The tour begins at Chennai, where we will first seek the blessings at Puzhal Temple. The shrine is an ancient as well as a popular pilgrimage site and houses grand images of first Tirathankara Lord, Risabhadeva and 23rd Tirthankara, Lord Parsvanatha. We shall then visit the two-tiered Jain Shantinath Jain Mandir, where the main deity is of Lord Parsvanatha. We will also visit the Adeeswar Temple, which is situated in Polal village and Sri Jain Swetamber Dadabadi, a 137 years old temple built in the memory of Gurudev. We shall bow our heads at the Jain Temples at Tirupparuthikkundram in Kanchipuram. The temples were built in the 9th Century A.D and contain several fresco paintings and a grand image of Lord Mahaveer. Upon arrival at Chennai, meet our representative who will assist you to the hotel. Later, we shall visit the Puzhal Temple, which is an ancient and popular tirtha in Tamilnadu. Here grand images of the first Tirathankara Lord Risabhadeva and Lord Parsvanatha are installed here. The temple is 1500 years old and was built by King Koorumbar of Chola dynasty. In ancient times, this place was known as 'Puzhal Kotalam'. Late evening, we will drive back to Chennai. Overnight stay at the hotel in Chennai. Post breakfast, we shall visit the Jain temple in Chennai, which is located in T. Nagar. It is a gleaming white, two-tiered Jain Shantinath Jain Mandir and the main deity here is Lord Parsvanatha who is the 23rd Tirthankara in Jainism. 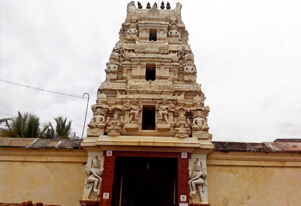 Later, we will drive to visit the Adeeswar temple, situated in Polal village . It is believed that the temple was constructed in the first century B.C. The main deity in the is of Rishabhadev, and the first Tirthankar of Jainism. Overnight stay at the hotel. Today, we will visit Sri Jain Swetamber Dadabadi that has been built in memory of Gurudev. Founded around the year 1838 (Vikram Samvat 1895) Sri Jain Swetambar Dadabadi Temple and Gardens are situated on the Konnur High Road in Ayanavaram. The temple is about 137 years old. Overnight stay at the hotel. Post breakfast today, we shall drive to Kanchipuram. On arrival check-in at a hotel. Later, we shall visit Jain Temples at Tirupparuthikkundram. The temples of the Jaina Tirthankaras were built in the 9th Century A.D here and they contain several fresco paintings and a grand image of Bhagwan Mahaveer. Overnight stay at the hotel. After having the breakfast, we shall drive back to Chennai. On arrival at Chennai, you will be assisted to airport/railway station for your flight/train for onward destination.